I joined the Orange Army to fight Multiple Sclerosis for my daughter and all the other people dealing with this disease. This is my 4th year serving as an Ambassador for MS RUN THE US. My daughter Heidi, who was diagnosed with MS in 2006, inspired me to get involved initially in 2015. 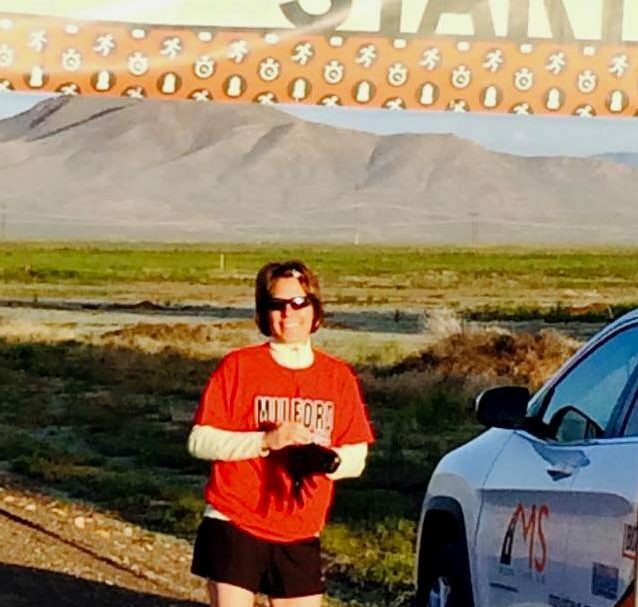 That year, she participated in the cross-country relay, completing Segment 4, running a total of 136 miles in 5 days in Utah. In addition to raising funds and awareness in the Lehigh Valley area, my husband Rich and I have enjoyed hosting the Segment 18 runners and crew members in our home. For the past 3 years, the Easton Area High School cross-country team has accompanied the runner through the city of Easton, and the Bethlehem Township Athletic Association has partnered with me to raise funds and awareness. Being exposed to the dedication and hard work of so many on behalf of family members, friends, and patients has provided me with the motivation to keep going, to keep doing what I can in support of the effort to eradicate MS, to find a cure, to help relieve the suffering. I am not a runner, but I can help spread the word, raise funds, and hold those with MS in my thoughts and prayers, and I ask for your help in doing all of these things. I am a retired Nurse Practitioner, wife, Mom, and Grammie to 5. In addition to being a part of the Orange Army, I enjoy “giving back” to the community through volunteer work at our church, and at a local Foodbank. I like to bake and cook, and also enjoy different types of needlework, especially knitting and crochet. My husband and I both enjoy being outdoors, traveling, and kayaking.